Author(s): Ahmed H.M. Elwahy, Mohamed R. Shaaban. Chemistry Department, Faculty of Science, Cairo University, Giza, Egypt and Chemistry Department, Faculty of Applied Science, Umm Al-Qura University, Makkah Almukkarramah, Saudi Arabia. Heterocycles constitute the largest diversity of organic molecules of chemical, biomedical, and industrial significance. They widely exist in numerous natural products, such as vitamins, hormones, antibiotics, alkaloids, herbicides, and dyes. They are also among the most frequently encountered scaffolds in numerous drugs and pharmaceutically relevant substances. 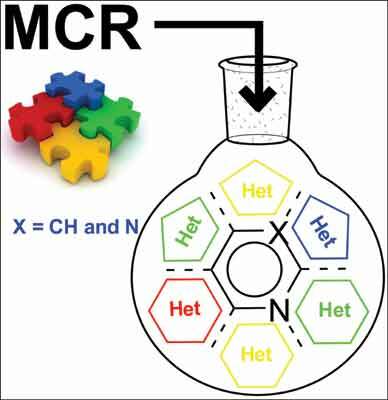 This review highlights some remarkable achievements made recently in the application of multicomponent reactions (MCRs) to the design of pyrido- and pyrimidofused heterocycles by multi-component reactions that have appeared in the last ten years. MCRs reactions can dramatically reduce the generation of chemical wastes, costs of starting materials, and the use of energy as well as manpower. Moreover, the reaction period can be substantially shortened. Keywords: Fused heterocycles, metal catalyst, microwave, multicomponent reactions, pyridine, pyrimidine. Affiliation:Chemistry Department, Faculty of Science, Cairo University, Giza, Egypt and Chemistry Department, Faculty of Applied Science, Umm Al-Qura University, Makkah Almukkarramah, Saudi Arabia. Keywords:Fused heterocycles, metal catalyst, microwave, multicomponent reactions, pyridine, pyrimidine. Abstract:Heterocycles constitute the largest diversity of organic molecules of chemical, biomedical, and industrial significance. They widely exist in numerous natural products, such as vitamins, hormones, antibiotics, alkaloids, herbicides, and dyes. They are also among the most frequently encountered scaffolds in numerous drugs and pharmaceutically relevant substances. This review highlights some remarkable achievements made recently in the application of multicomponent reactions (MCRs) to the design of pyrido- and pyrimidofused heterocycles by multi-component reactions that have appeared in the last ten years. MCRs reactions can dramatically reduce the generation of chemical wastes, costs of starting materials, and the use of energy as well as manpower. Moreover, the reaction period can be substantially shortened.